Australia has unveiled the world's largest gold coin, weighing in at a massive 1,000kg. The Perth Mint produced it in time for Queen Elizabeth's visit to the city in Western Australia for the Commonwealth heads of government meeting. 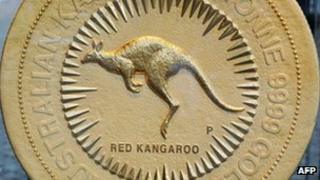 The coin has a kangaroo on one side and the Queen's profile on the other. It is nearly 80cm in diameter and 12cm thick. Perth Mint CEO Ed Harbuz said making it was "an incredible challenge, one which few other mints would even consider". The Australian coin is 10 times heavier than the world's previous largest gold coin, made by the Royal Canadian Mint. "We thought well, we'd better make it so much bigger that it'll stay the biggest coin in the world for a long time," Mr Harbuz said. Australia's coin is 99.99% pure and has a nominal value of A$1,000,000 ($1,061,000; £663,000). The gold itself is worth more than A$50m.